Dallas Fair Park - 29. Cotton Bowl Stadium. Cotton Bowl Stadium dominates the center of Fair Park, viewable from all sides of the park. 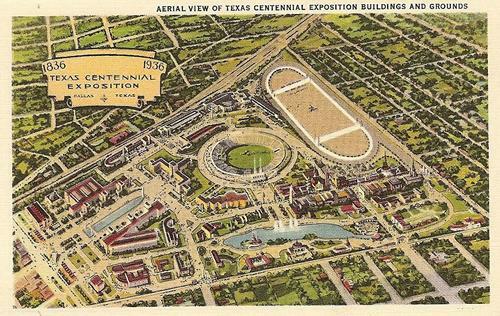 Built in 1930 for the cost of 328,000 dollars, the place was first called Fair Park Stadium. Two high school footballs teams became the first participants to play at the new venue, which had the seating capacity of 46,000. Two years later, it hosted the Red River Showdown for the first time. The college football contest between the University of Oklahoma and Texas A & M has also been called the Red River Rivalry and Red River Shootout, just to name a few. Regardless of which name is used, the reference to the Texas-Oklahoma border remains, serving as a reminder of the conflict between the two states over the natural barrier. This was particularly true when the game arrived in 1932 because the Red River Bridge War had occurred a year earlier. The war all started when the two states worked together to build a free bridge over the river. The Red River Bridge Company had operated a toll bridge between Denison, Texas and Durant, Oklahoma for many years. When the project was completed, owner Benjamin Colbert obtained an injunction on July 10th, claiming that the Texas Highway Commission had promised to buy the old toll bridge. Texas governor Ross Sterling responded by sending workers to build a barricade at the Texas end of the new bridge. Oklahoma governor Bill Murray didn't like this and sent highway crews to destroy the barrier, claiming he had the authority to do so because both sides of the river belonged to Oklahoma through the Louisiana Purchase agreement. This prompted Sterling to send a general and three Texas Rangers to defend the workers while they rebuilt the barricade. While this was going on, Murray had the approach to the toll bridge on Oklahoma's side demolished to prevent further passage. On July 24th, he declared martial law and personally led the Oklahoma National Guardsmen to the spot to ensure that no one would try to repair the obstruction. His plans were thwarted, however, when he received an injunction from the state court prohibiting him from blocking the toll bridge. Murray responded by ordering his men to allow passage on both bridges and expanding martial law to the new one. On August 6th, the injunction and martial law were withdrawn, paving the way for the new bridge to officially open on Labor Day. This conflict was still fresh on the minds of spectators for the 1932 game, but it was not the first time that the Texas Aggies and Oklahoma Sooners played. That honor went to a contest in the year 1900, back when Oklahoma was still a territory. Both teams had no nickname, though the one from Texas was often called Varsity. They continued taking turns hosting the annual tradition until 1912. The officials chose Dallas to be the official location because the city was situated at the midpoint between Austin, Texas and Norman, Oklahoma. The two universities take turns being the home team and evenly share the ticket revenue. 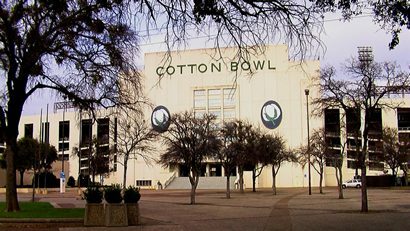 Fair Park Stadium became Cotton Bowl Stadium in 1936, a year before the first Cotton Bowl Classic took place. Oil businessman J. Curtis Sanford financed the sporting event between Texas Christian University and Marquette University. The game attracted a modest audience, but it wasn't enough to cover the expenses. Nevertheless, Sanford agreed to pay for the second match-up, which featured the football teams from Rice University and the University of Colorado Boulder. The game was a profitable success and the Cotton Bowl remained in Fair Park until 2009. The annual tradition moved to Cowboys Stadium in Arlington the following year. The football team of Southern Methodist University had been going down a long spiral, and the 1945 season seemed to be a continuation of the trend. However, when the series reached the midway point, a running back named Doak Walker joined the team. The Mustangs immediately transformed into a different group of players that ended the season with three shutout wins. Hope in the team was renewed, even when Walker announced his intentions to join the military. He returned in 1947 and helped bring the team victory after victory. On November 1st, SMU faced the University of Texas at Austin, another undefeated team battling for the the Southwest Conference championship. Skyrocketing ticket sales forced the game to moved to Cotton Bowl Stadium. Even with its high-capacity seating, the venue had to resort to standing-room-only accommodations. Officials agreed they need to enlarge the stadium and SMU made the decision to play all its home football games at Fair Park starting in 1948. Construction began almost immediately to add two decks to the stadium, bringing its total capacity to 75,504. The Mustangs continued playing at Fair Park until the team moved in 1978 to Texas Stadium. In 1956, the stadium hosted its first historic music concert. A very young Elvis Presley came to town and attracted over 27,000 people in the process. The event provided the largest audience for an outdoor concert in the state's history. The professional football team known as the Dallas Cowboys came into existence during 1960 and played its home games at Fair Park. After six seasons of dismal failure, the Cowboys managed to obtain a winning record in 1966. It was during this time that the American Football League merged with the National Football League. After becoming the Eastern Conference champions, the Dallas Cowboys would compete against the Green Bay Packers at the Cotton Bowl Stadium for the first division title game under the new merger. The Packers were victorious on that New Year's Day of 1967, proceeding to win the league's first Super Bowl championship. The Dallas Tornado played its first season at the stadium in 1967 as one of the original teams participating in the United Soccer Association. At the time, international soccer clubs played as American teams throughout the nation. In the case of the Dallas Tornado, its members came from Dundee United, a team which participated in the Scottish Football League. The following year saw the merging of the National Professional Soccer League and United Soccer Association to form the North American Soccer League. This meant that the owners of the Dallas Tornado would have to find new players and a new coach. Lamar Hunt and Bill McNutt ended up hiring Bob Kapp, a Serbian whose family moved to Canada in 1956 to seek refuge from the Hungarian Revolution. Bob Kapp immediately went to work searching for players throughout Europe. Before the next season began, Bob Kapp took his new team on a world tour of thirty-two games. Although the Dallas Tornado only won two games, the effort provided international recognition, mostly because the United States had little involvement with the sport compared to the rest of the world. The soccer team didn't do well during its 1968 and moved to P.C. Cobb Stadium near Downtown Dallas a year later. The players proceeded to win their only NASL championship in 1971 when they competed against the Atlanta Chiefs. The stadium changed for the better in 1968 when backs were added to the seats. It also saw the application of astroturf in 1970. A year later, the Dallas Cowboys left Fair Park so they could play at the new Texas Stadium in Irving, which opened to the public on October 24th. The first season of the Texxas World Music Festival took place at Cotton Bowl Stadium in 1978. More routinely called the Texxas Jam, it was a multiconcert event that lasted during the summer. David Krebs, the manager of rock performers Aerosmith and Ted Nugent, wanted to do something similar to a festival called California Jam. Unfortunately, he knew nothing about organizing large events. He solved the dilemma by contacting concert promoter Louis Messina to help him, leading to a three-day festival of country and rock. Musicians appearing at the venue included Blackstone, Walter Egan, Head East, Van Halen, Heart, Eddie Money, Journey, Ted Nugent, Aerosmith, Atlanta Rhythm Section, and Mahogany Rush. The event was a huge success with attendance figures exceeding 80,000. Texxas Jam continued until 1988, attracting performers such as Boston, Sammy Hagar, the Eagles, and Deep Purple. Because the stadium was chosen to host six matches of the FIFA World Cup, officials had to widen its field and increase the size of the press box. The participating soccer teams represented the nations of Spain, South Korea, Nigeria, Bulgaria, Germany, Argentina, Saudi Arabia, Sweden, Brazil, and the Netherlands. In 1995, the SMU mustangs returned to Fair Park, playing home games there until 2000. That year brought the grand opening of Gerald J. Ford Stadium, which had been built over the previous Ownby Stadium in University Park. The Dallas Burn joined the Major League of Soccer in 1996 and called Fair Park its home until 2002. A year after returning in 2004, the team changed its name to FC Dallas. The soccer players left the city for the 2006 season, this time moving to Toyota Stadium in Frisco. In 2006, officials from Texas A & M and the University of Oklahoma announced the possibility of taking turns hosting the Red River Showdown. The reason for this discussion was the mutual feeling that Cotton Bowl Stadium lacked the necessary seating capacity needed to guarantee an increase in revenue. Wanting to keep the game in Dallas, Mayor Laura Miller scheduled a bond election which would provide thirty million dollars to improve the stadium. Funds from the local government and state fair organization would give an additional twenty million dollars. Once the mayor made her decision and preparations began on improving the sports venue, the two universities agreed to stay. The new, improved stadium opened in 2008 with the capability to hold 92,100 people. It had a special VIP room in addition to a new press box, scoreboard, and video screen. The plumbing, lighting, and sound system received upgrades and all the seats were replaced with new ones. The Cotton Bowl Classic left Fair Park in 2010 and moved to Cowboys Stadium in Arlington so the game could become part of the Bowl Championship Series. Officials immediately looked for a replacement and temporarily called it the Dallas Football Classic. The name was changed to the TicketCity Bowl when the online ticket reseller agreed to provide funds for the 2011 game. PlainsCapital Bank took over the following year, leading to the last and final name. The Heart of Dallas Bowl enjoyed the bank's backing until 2013, then obtained a sponsorship from a restaurant called Zaxby's. The latest development at Cotton Bowl Stadium was a soccer match for the 2014 International Champions Cup.